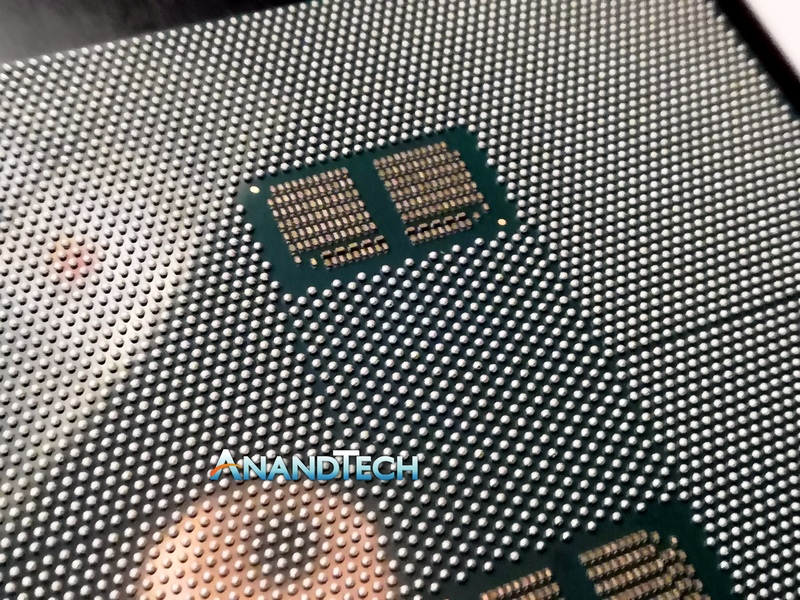 The package measures 76.0 x 72.5 mm, making it Intel’s largest CPU based* package ever, beating out the old Intel Pentium Pro, which was 67.6 x 62.5 mm, and AMD’s EPYC package, which is 75.4 x 58.5 mm. 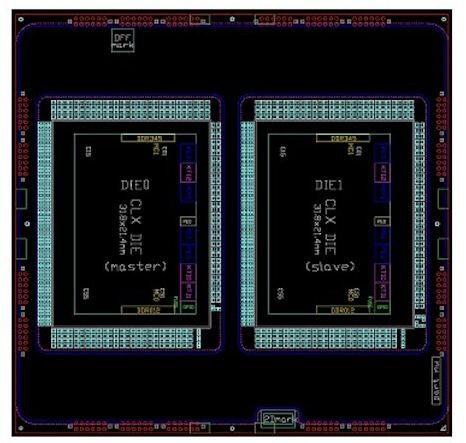 Inside the package is two XCC enabled silicon die, one designated a master, and one a slave. The die themselves are ~694mm2 each. The socket is officially called FCBGA5903, which stands for flip-chip ball-grid array 5903, with 5903 being the number of contacts or ‘balls’ on the underside which goes onto the motherboard, much like an embedded chip. 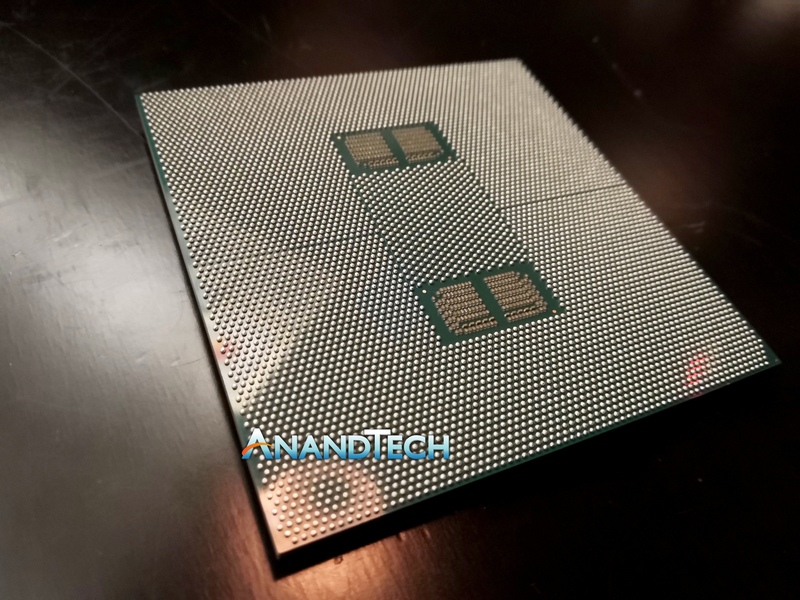 By contrast, AMD’s EPYC chip has 4094 pins. The reason for all these contacts are mostly in the memory: as this Platinum 9200 processor has twelve memory channels, these all require pins. There are also some more for power, as the TDP for the 56-core version is 400W. In terms of weight, the processor is definitely around 0-300g, or half a pound. This was measured very scientifically by comparing it in my hands to the weight of my heaviest phone, and then comparing it to two phones. The chip certainly has some hefty bulk, but given that it is a BGA design, it’s unlikely that even people using the chip will ever hold it. If we look side on to the design, we can see that the package actually has three distinct layering stages (five, if you include the caps). The light brown and dark brown layering totals up to 18 layers (recorded by eye, hard to see in difficult light), and the dark brown layers are clearly double the thickness of the light brown layers, which might indicate that these are the power planes of the package. Normally we see processors with anywhere from 8-12 layers total, so this is another step up above that. A close up of the ball array shows the fine pitch between the contacts. The capacitors on the underside are extremely tiny in comparison to other CPUs – I mean really small. Each of these corners has 87 capacitors, making for a total of 348. Pricing for this family of processors is not expected to be disclosed. 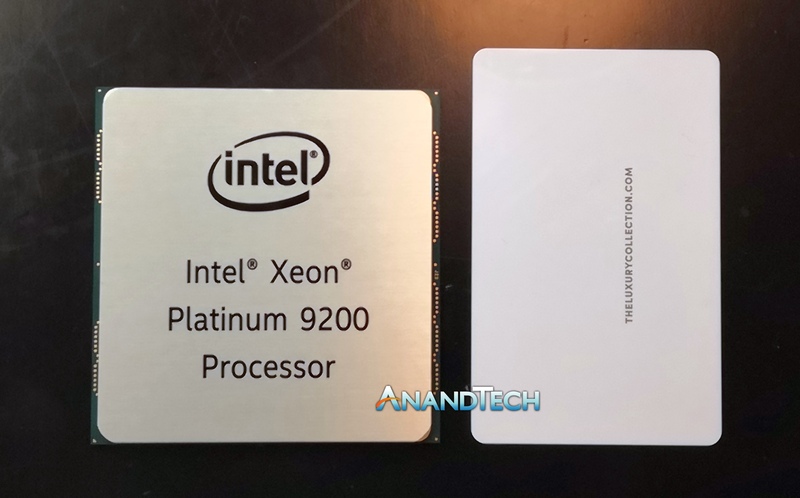 Intel has stated that as they are selling these chips as part of barebones servers to OEMs that they will unlikely partition out the list pricing of the parts, and expect OEMs to cost them appropriately. 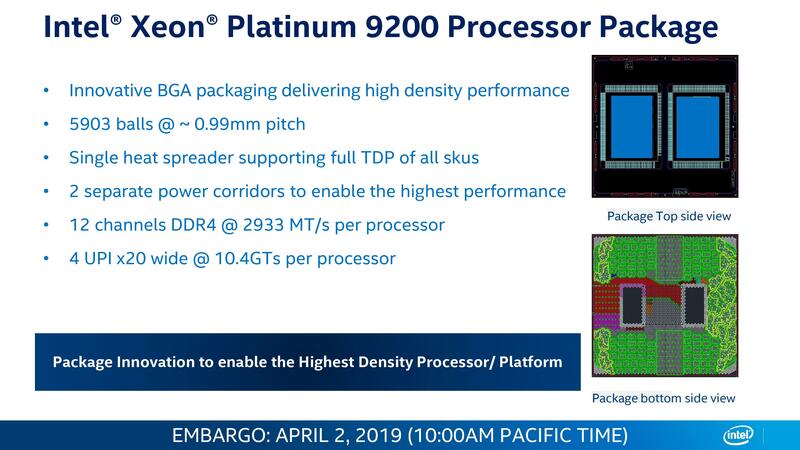 Given that the new high-end Intel Xeon Platinum 8280L, with 28 cores and support for 4.5 TB of memory, runs just shy of ~$18k, we might see the top Xeon Platinum 9282 be anywhere from $25k to $50k, based on Intel margins, OEM margins, and markup. *Intel may have FPGA products that exceed this size, mainly due to HBM and other chiplets on board.